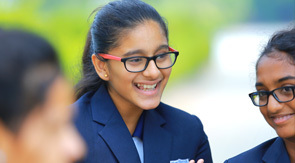 Manchester International School offers the CBSE curriculum. Here the students are taught as per the CBSE norms. The faculty at the school regularly reviews the curriculum, through the guidelines provided by CBSE to ensure that what we teach, meets the developing needs of all students in this increasingly technological world. The defined curriculum provides new challenges and enjoyable learning experiences to meet varied needs of children. The curriculum as per the guidelines of CBSE and innovative enhancements from our end becomes more coherent and meaningful from the learner’s point of view. Well-equipped and furnished class rooms with Modern facilities. Spacious and modern Laboratories with latest scientific apparatus and innovative instruments-Mini research Centre. Library with more than 4000 books. Well furnished computer laboratory for students from KG onwards. Classical dance, western dance, yoga, Art and Craft are some of the special extracurricular activities apart from the regular ones. Transport facility is available from all the corners of the city. Experienced and qualified teaching faculty. CBSE (Central Board of Secondary Education), the education and learning system is separated right into primary, secondary and senior secondary levels.. These three levels of system play a substantial function in developing students' career, aim and success. CBSE is accountable for preparing the curriculum for the secondary and senior secondary levels so that most popular system that many parents go with. Essentially CBSE board carries out two exams-- the All India High School Evaluation, AISSE (Class X) as well as the All India Senior School Certificate Examination AISSCE (Class XII). CBSE is identified by the NCERT (National Council of Educational Research Study and also Training) with the goal to operate a chain of central schools (Kendriya Vidyalaya) that can accommodate the civil servant who remain in transferable work. A number of private schools have begun to serve CBSE considering that the private sector employees are also moving from area to area. It is recommended for parents having transferable jobs. The CBSE syllabus is really structured, highly foreseeable and also controlled. The majority of considerable thing is that nationwide entryway exams are performed as per this curriculum. CBSE Board accepts both English as well as Hindi as medium of directions in class. CBSE is associated to a multitude of institutions around India as the board permits both regular prospects, who study in CBSE schools, in addition to private candidates from non-affiliated schools to appear in the tests. CBSE syllabus has even more concentrated on Science Subjects and also Mathematics. As CBSE syllabus is more suitable for entrance examinations, major competitive examinations like IIT –JEE (Indian Institute of Technology Joint Entrance Examinations), AIEEE (All Indian Engineering Entrance Examination) , AIPMT(All India Pre Medical Test) follow the CBSE pattern. CBSE is the best choice for students who want to pursue a career in medical or engineering. CBSE offers more talent search evaluations as well as scholarships for students. The certificate offered by CBSE School is internationally valid, yet it has a better footing in the subcontinent than other board.